The construction and heavy industries require a lot of lifting; lifting materials, lifting other plant and equipment and moving any 'load' from point A to point B (which can be anything from the deepest tunnel to the tallest tower). Today, with the advances in lifting technology and the onus on human safety, more and more lifting jobs and activities rely on lifting equipment. So what are the different types of lifting equipment which require a lifting equipment inspection procedure in the first place? All of these lifting equipment are extremely important to many companies, site and projects, and each play their own party in enabling our projects, infrastructure, buildings and assets to continue getting more sophisticated - while keeping people safer. 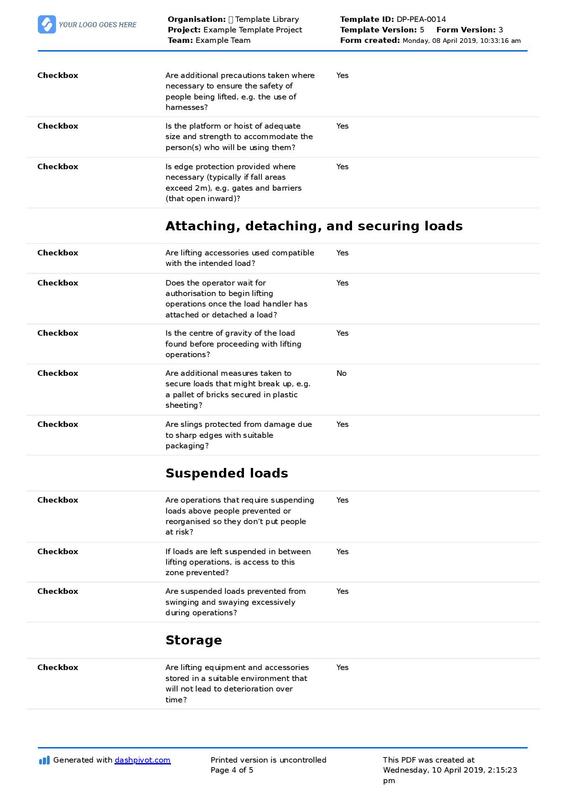 Why is your lifting equipment inspection procedure important? But maintaining all of these pieces of equipment comes with it's own set of challenges. The increased level of risk, scrutiny and consequence attached to using and managing these types of lifting equipment is reason enough to place a large focus on your inspection procedure - and to continually improve it over time. Having a strong and reliable lifting equipment inspection procedure in place reduces the risk associated with heavy lifts, and dramatically increases the chance of your lifting equipment always being in good and safe working order. At the heart of your lifting equipment inspection procedure are the lifting inspection checklists workers conduct and document on a frequent basis. Many companies engage in daily or weekly crane checks (as well as daily crane plans like this) and other cadenced checks on lifting equipment to ensure (as much as possible) that no piece of equipment is started or used in poor condition. As we have mentioned, there are a number of different types of lifting equipment, and many of these pieces of plant and equipment do have their own specific checklists and processes which are unique to their structure, features etc. But there are also some more general checks and balances which companies can enforce on all of their lifting equipment which can eliminate silly mistakes and prevent errors which are applicable across all types of lifts and all types of lifting equipment inspections. 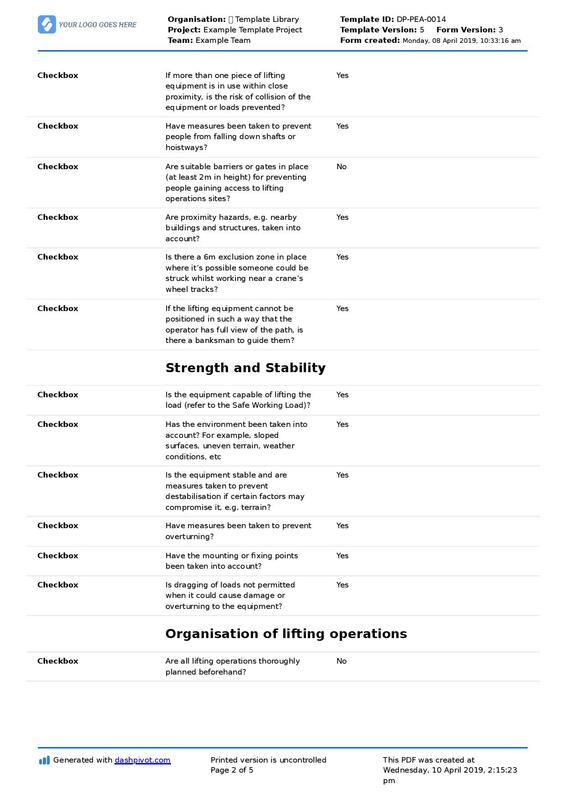 The lifting equipment inspection checklist you see below is a good example of a framework which guides workers and lifting equipment operators through the right lifting equipment inspection procedure. 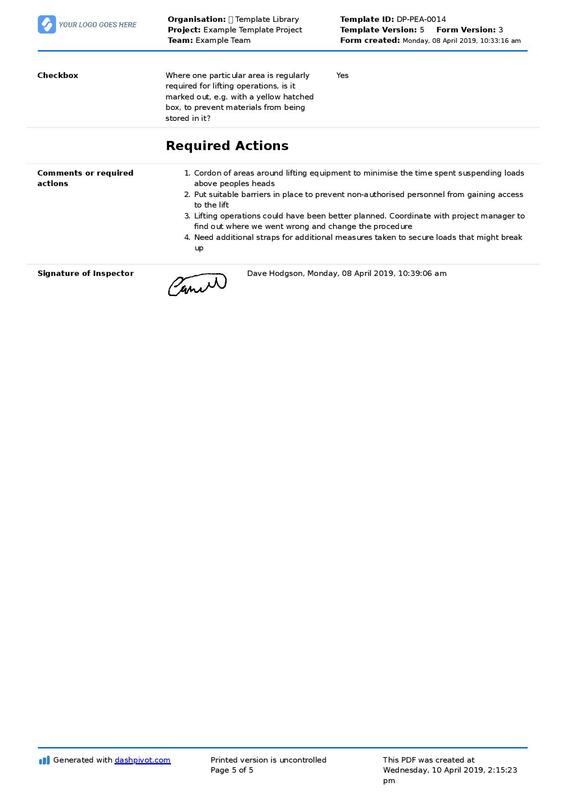 As you can see by previewing the below form, each checklist ensures that all of that important record keeping information including the person responsible for the checks and the date and time of inspection are included - which are critical parts of any procedure documentation and process. After going through all of these inspection items, the inspector or equipment user or operator can then outline some corrective actions and sign off on the document. You can easily see the importance of including this type of structure in your lifting equipment inspection procedure - and how following this procedure can eliminate silly mistakes and forgetfulness and ensure that issues get actioned and solved quickly. If you can use an inspection procedure like this across all of your lifting equipment at regular enough intervals, lifting equipment safety and maintenance almost takes care of itself. 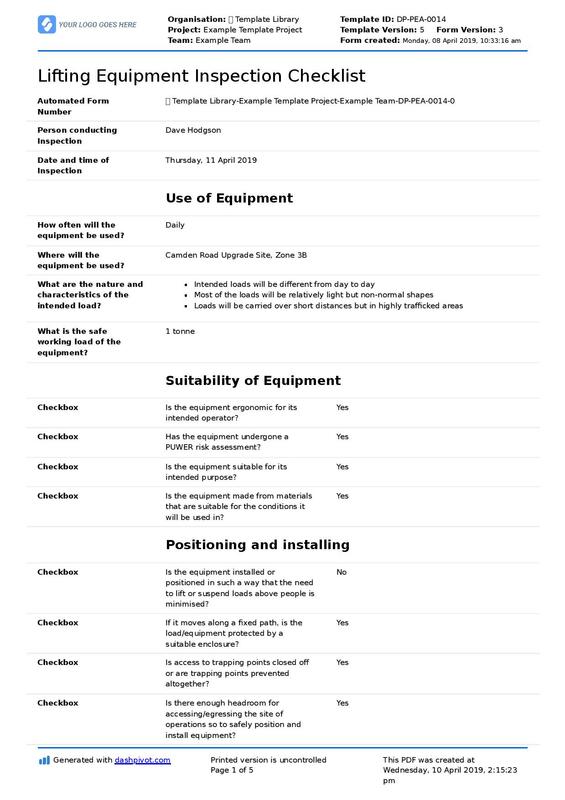 Use and edit this lifting equipment inspection procedure PDF for free. Creating a comprehensive and bulletproof lifting equipment inspection procedure is all good and well in theory, but they can often fall over and fail at the next hurdle - which is how they are implemented, conducted and tracked over time. Many procedures and processes start out with a good plan and the right intentions, but there is a lack of communication and structure to how the procedure is communicated to guys on site - and the friction associated with managing the procedures is just too time-consuming and difficult. But many of the challenges associated with lifting equipment inspection procedures are general admin and communication headaches which can be solved through better tooling and processes. 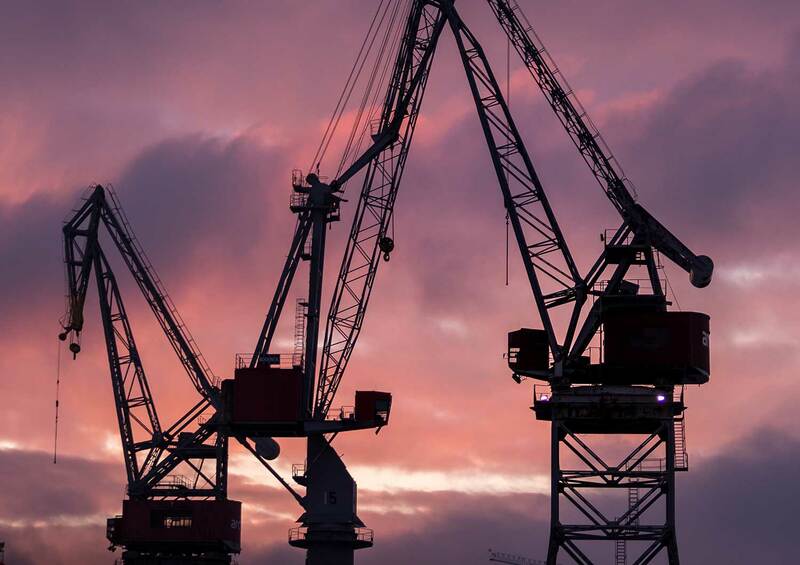 There are now equipment and asset management softwares which enable companies to completely digitise how lifting equipment procedures are created and implemented. These systems enable companies and workers to manage plant, equipment and assets - including lifting equipment - effectively from start to finish. At the office and administrator level, companies can deploy standardised templates and procedures down to the project, team and site level. These procedures and templates can then be accessed and completed from site using mobile and tablet devices (as well as computers of course) ensuring every team and person is working off the same and latest version of a procedure or document. 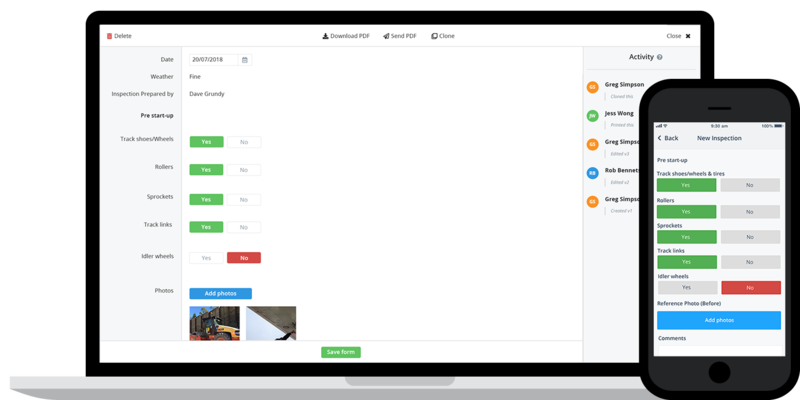 Because of this standardisation, all of the lifting equipment inspection findings and data is processed automatically and organised into registers and dashboards where companies can see what's happening in real-time. Over time, companies can easily spot the weaknesses in their procedures and make informed decisions about how to improve - while lifting equipment operators and inspectors can finally do their work efficiently, by swapping time-consuming and manual paper, word docs, spreadsheets and PDFs for smart documents which do a lot of the 'heavy lifting' for them. Establishing what you want your lifting equipment inspection procedures is the first step in the process, but making sure you have the tools and controls necessary to implement these procedures is equally important. 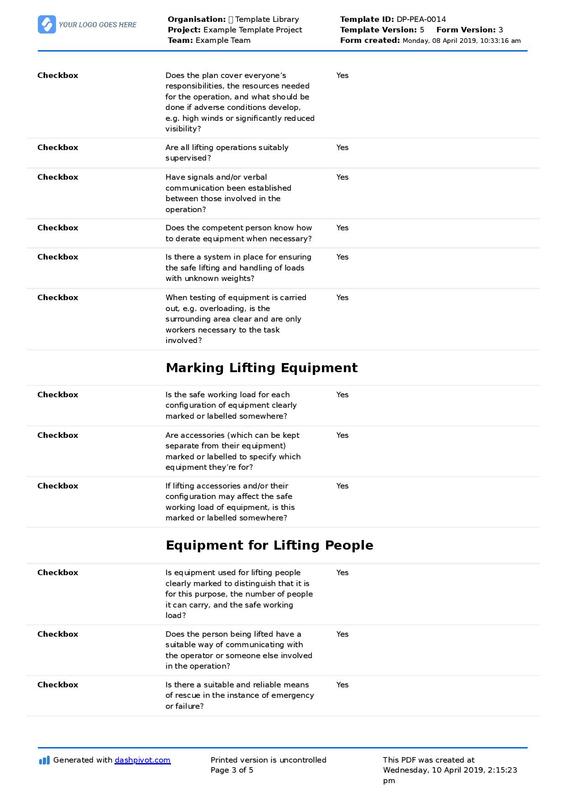 Use this general and reliable checklist template for any or all of your lifting equipment. Streamline daily or monthly crane inspections on any type of crane. Sitemate is flexible project managament software which enables companies in the industries to streamline project and asset management - their way.